If you happen to be a fan of the beautiful game, the Fluid Football game for both iOS and Android has been available for a while, and has been downloaded in excess of one million times. But what about football game loving fans on other mobile platforms? Well Fluid Football is now available on three other platforms, BlackBerry, Amazon’s Kindle Fire platform and the Barnes & Noble Nook. Fluid Football enables the gamer to play through eighteen challenging cup competitions with 144 levels, and has been designed by real world tactical experts, with intuitive drawing based controls so the gamer can control complex scenarios. 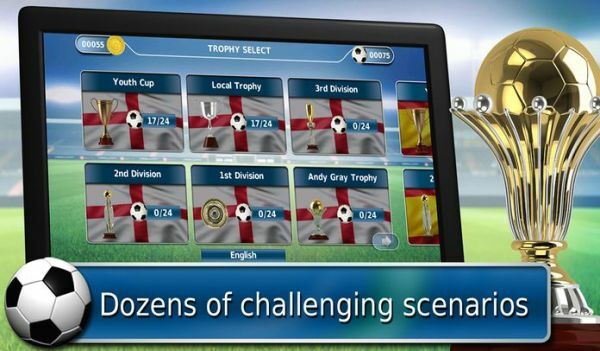 The game also delivers a full hints system to help the gamer overcome the trickier challenges, there is also a 3D view for precision goal shooting, the ability to unlock dozens of challenges and more will be added with future updates, whilst commentary is supplied by Sony Award winning team Richard Keys and Andy Gray. Gary Cooper Media, AppyNation and Chromativity are investing more effort and time into the brand and hope to bring Fluid Football to millions more football gaming fans across the globe, along with adding more benefits and features for gamers, whilst new versions of the popular game are planned soon with other surprises in store. The Fluid Football Pro game for the BlackBerry PlayBook and BlackBerry 10 devices is available to download at a cost of $2.99 from BlackBerry App World. Those that use the Amazon Kindle Fire and Kindle Fire HD can also purchase Fluid Football from Amazon for $2.99. Those gamers that own the B&N Nook and would also like to take advantage of what Fluid Football Pro has to offer, you can download the mobile game to your Nook Color, Nook tablet, Nook HD, and Nook HD+ at a cost of $3.99 from the Barnes & Noble website.